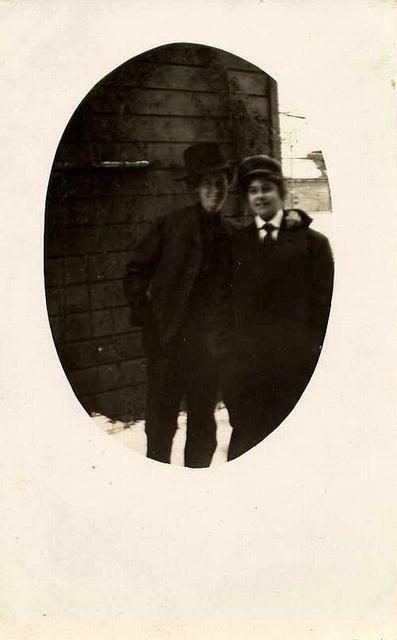 An unusual real photo postcard of two figures -- two women? a boy and a girl? Real photo postcards were first popular in the early decades of the 20th century, and are still made today. Not to be confused with mass produced, lithographed postcards, these are actual photographs with postcard markings printed on the back of the photographic paper. The arrangement and design of the postcard backing can often be used to date the card. Some real photo postcards are multiple-printed images produced for sale by professional photographers. Others are unique prints, snapshots or other photographs which were printed on the postcard back rather than on standard photographic paper. These are the most valuable, since they are essentially one-of-a-kind images. The value of a photograph is not to be diminished merely because it is printed on a postcard back. As an example, vintage real photo cards made by Andre Kertesz in the 1930s now sell for tens of thousands of dollars each.or...? Items Similar To "Two Obscure Figures"
Old A Carrier French Cast Bronze Figure Woman with Flower Basket & Child 27"